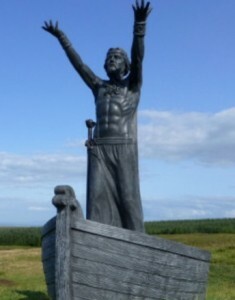 This sculpture of Manannan, by John Sutton from Dungannon, disappeared from Binevenagh Mountain outside Limavady in January 2015. Those who stole the statue left a wooden cross in its place with the words; ‘You shall have no other gods before me’. The statue was found one month later and is to be replaced. As we glimpse safe harbour after our mammoth Immram, we take the opportunity to get to know a favourite Otherworld character. But where does Manannan Mac Lir come from? Is he all he appears to be? This quest became so huge that we had to split it into two episodes. So join the Story Archaeologists as they part the mists to look for this maratime Lord of the Sidhe. Be prepared for more surprising navigational twists in the next episode! ← Mongán, Taliesin, Finn and Arthur!